Add sparkle to any project, at home or in the classroom. Glitter Glue squeezes out easily and dries in 30 minutes so children can make their artwork shimmer anytime. 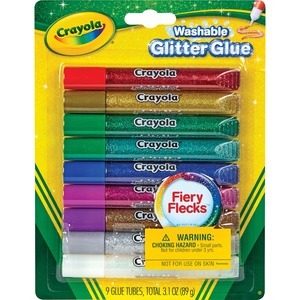 Washable Glitter Glue comes in nine bold colors: blue, green, jade green, natural, silver, gold, multi, red and purple. Nontoxic glue is acid-free for archival decorating like scrapbooks and journals. It should not be used on skin.